Bottcher’s Team Wild Card squad from Edmonton advanced to tonight’s final of the 2019 Tim Hortons Brier, presented by AGI, by executing a triple-tap raise with his final shot to score two for a 5-4 semifinal win over Northern Ontario (Sault Ste. Marie), skipped by Brad Jacobs. 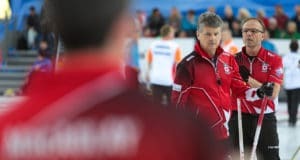 Wild Card, with third Darren Moulding, second Brad Thiessen and lead Karrick Martin will face Alberta, skipped by Kevin Koe, who has yet to lose a game at this year’s Tim Hortons Brier. 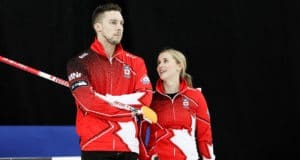 The Bottcher bunch lost last year’s final in Regina to Team Canada, skipped by Brad Gushue, a team they eliminated in the 3-4 Page playoff game Saturday night. 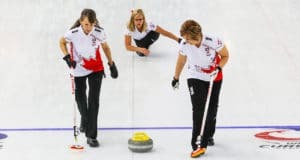 Well they did, and they will again tonight, but this time against Koe’s Calgary crew. “It really speaks to the depth we have in Alberta. I was hoping the two of us were going to play each other in the provincial final, but I’ll take the Brier final,” said Bottcher, whose squad won a sudden-death wild card against Toronto’s John Epping the day before the Tim Hortons Brier started to nab the final berth. Following the fifth-end break, with the score 3-3, only one point was scored in the next four ends as both teams played it close to the vest, unwilling to get aggressive for fear the game would get away from them. “The key was just patience. It was a long game, a long slog. So was our game yesterday. You’ve just got to keep going and hope you’ll get a few breaks along the way and we did,” said Bottcher. Moulding had no doubt Bottcher would make the last shot for the win. “It’s Brendan. He makes them all when it matters,” said Moulding, who feels different about this year’s trip to the final compared to last year. “We’re a little bit more even keeled, a little calmer. We know what it’s like to be here. We feel like we have a good chance, it’s going to be a good game tonight and just stay nice and even and see what we can do. In the last five national men’s curling championships, including this one, Jacobs, third Ryan Fry, second E.J. Harnden, lead Ryan Harnden, alternate Lee Toner and coach Adam Kingsbury have gone 46-9 in the round robin, including 9-2 this week, but have yet to go on to win the final. “We had our opportunities,” said Jacobs, the 2014 Olympic gold-medallist and 2013 Tim Hortons Brier champion. “It was a great back-and-forth game, to be honest with you. Kudos to Team Bottcher. They played very well, and they’ve had a great week so far. We just couldn’t pull it off today. The 2019 Tim Hortons Brier continues with the final tonight at 7 p.m. (all times CDT).